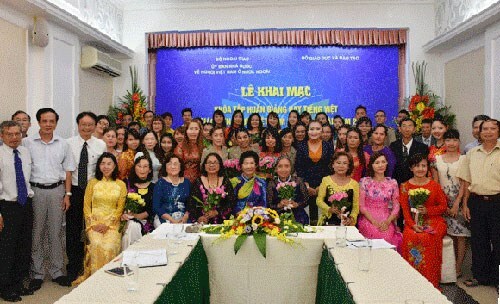 Hanoi (VNA) – Seventy eight overseas Vietnamese teachers from 12 countries and territories are participating in a training course on teaching the Vietnamese language in Hanoi from August 13-27. The course is designed to improve teaching skills of participants through lectures by linguistic experts. Fact-finding trips to historical and cultural destinations will also be held during the two-week event, helping promote Vietnamese culture and history to expatriates. Promoting the mother tongue among Vietnamese expatriates plays an important role in supporting overseas Vietnamese communities in preserving their cultural identity and traditional customs, Deputy Foreign Minister Vu Hong Nam said at the course’s opening ceremony on August 14 in Hanoi.